NEW LOOK TO THE OLD FORUM..
Due to some issues recently rearing their nasty faces, joe made the following updates and changes..
1. Moved entire forum behind SSL/https (yesterday). 2. Updated phpBB to version 3.2, which required a new design (subsilver no longer supported). 3. Entirely new responsive theme that looks like your old one, but made with prosilver. It's completely responsive on mobile devices and tablets. 4. Cleaned up and refreshed the charlie bird logo and paypal donate button. 5. Updated php version from 5.6 to 7.0 (changed acm_type from apcu to file caching because phpBB isn't compatable w/ php7's apcu yet). 6. Fixed the /GET errors and broken PM notifications. 7. Installed a stopforumspam extension to assist with new spam registrations, I saw a few of them and didn't want anybody wasting more time deactivating them when they sign up. for me, after all the years the sub-silver design has been the forums face it is taking ME time to get used to where every thing is..
but it IS clean and shiny i think..
i hope all y'all like it..
thank you joe for all your work..
Re: NEW LOOK TO THE OLD FORUM..
IBM Lenovo X1 Carbon (1st) / T61 / iPad Pro 12.9 (2015) / iPad 10.5 (2017) / iPad Mini 4. Few people like change, and I've had some feedback sent to me already. The old style was based on tables, which has fallen out of favor because it hinders blind screen readers and a mobile responsive web. Since phpBB removed the Subsilver-based template we were modifying with each update, we had to modify a Prosilver style to look as much like the old design as possible. In addition to being responsive, it's faster loading, uses fewer images and more fontawesome, etc. Now would be a good time to talk about the "similar topics" that were appearing at the bottom of the page. For a technical help forum, they tend to be very valuable at helping people (especially Google searchers) find answers if the topic they landed on didn't do a good enough job. They also help search rankings by lowering bounce rates. I'm disappointed it was deactivated so quickly. For those that didn't like looking at it, could you explain why? It was placed below the topic reply button so it shouldn't have made it more cumbersome for older users. Logged in last night, and whoa!, looks similar but still quite different. Can't really say yet whether it's better or just different, but will take some getting used to. I do, however, like the responsive nature of the new site, as I find myself using a smart phone more and more to check the site. The new forum looks rather washed out. IMHO there is an awful lot of space wasted for various headers, links, etc. I also don't like the Author's info on the right side of posts. I'm missing the PM link in the upper line (Homepage/Forum/Drivers/etc.). The PM Notifications can't be removed/emptied. Overall I am seeing much fast loading times and the theme is appealing to the eyes. I think it will just take time however to get use to the author's info on the right instead of the left. I see this as being the biggest challenge for me. Overall though I think it is an improvement! I really like it, particularly on mobile (where I browse the forum most often). Overall it looks quite similar to before, but with a few polished elements. Would it be more feasible now to add a dark theme alongside this recent update? I code in dark themed IDE's and feel blinded when I switch back to the browser. I don't like the new look. At all. Way too bright and shiny, and not in a good way IMO. Having everything that was on the left now on the right is also not something I'm thrilled about. Makes reading and posting more difficult IMO. The functionality of the forum itself - now that the bugs have been cleaned out - is good. The new look, looks busier and more cluttered. Having said that, the author's box on the right have a lot of empty unused space on a 1080p screen. On the functional side the site is much faster. Thanks Joe. Biggest headache for me is the author info on the left - having been browsing for about an hour after I posted first message in this thread - it is still not getting any easier. The nw look, looks busier and more cluttered. Having said that, the author's box on the right have a lot of empty unused space on a 1080p screen. I second that. The style has width:22% that's too much. Another dislike: when you make a PM, there's an awful lot of space wasted again, this time above the box where you type in the message text. On smaller laptops you need to scroll down before you can do something useful. Why do we need to see all these headers? I'm loving the new theme so far. I'm not sure about the right-aligned user info, but it's a refreshing change from the boring layout that every other forum has. Font sizes also seem to finally be fixed. They were way too tiny before. I was worried when I couldn't connect from my Forums app this morning. I had to update the bookmark because of the https change. I am very (very!) unsatisfied with the new "layout"; sorry to say. If I had the power to revert to the previous, well-proven layout, we'd be back to that in a split-second. There's a good word in computers saying: "If it ain't broken, don't fix it!" Why make all these completely unneccessay (and counter-productive!) changes to something that has functioned perfectly for years and years?? It simply goes far beyond my ability to understand why all these changes have been decided (by who? when? ), and implemented. I'd say: Let's immediately go back to the old style. The sooner, the better! Very dissapointed, really, absolutely truly. I'm sure there were important reasons to upgrade the forum software and switch completely over to https for security reasons. Unfortunately, the old styles are not always compatible with the new versions of the software. I've had the same issues with my own forum. They're not decisions made lightly. As an aside, there's nothing wrong with using tables for some of the layout. Thank you for understanding and explaining. Absolutely agree! However, if you're using it to display a full website layout rather than just some formatted data, screen readers are gonna have a bad time with the order of things. Totally agree, I hate wasted space also. This was part of the Prosilver design. We changed as little as possible from the style and used template inheritance to make merging between phpBB updates easier. I'll add to my to-do list setting a max-width on that area. Thanks! We're using php7 handled by php-fpm and Nginx as a front-end proxy for Apache now, which helps reduce server load and asset delivery time. Also, we're doing a better job of setting expires headers/leveraging browser caching and other things that make navigating site after your first page load much faster. We automagically forward requests from the http:// to https:// so that folks won't get lost, and everyone stays secure. I'm guessing your issue is with Tapatalk or some other app, and unfortunately I wasn't aware that there would be issues with that, and even now I don't know what I could do to alleviate that. Having everything that was on the left now on the right is also not something I'm thrilled about. Makes reading and posting more difficult IMO. Profiles on the right is the way Prosilver does them by default. The idea is that the content that's most important to read should be the most prominent, and that's usually the stuff on the left side. Here's a source on that: eyetracking visualizations show that users often read Web pages in an F-shaped pattern. I didn't vet that or look for more data, but it backs up what I've learned and read over the years about web design. It's different than what you're used to here, but elsewhere I think you'll find it commonplace, especially at web-forward websites. Way too bright and shiny, and not in a good way IMO. Sorry, it is a bit brighter. Thanks! I wrote about the right-aligned user info a few quotes up. The fonts should scale much better with DPI changes now, especially on smaller screens. Server software: it moves forward or gets hacked. Some things get faster, some old functions break. The phpBB 2.0 code we were using in 2005 would have broken nearly a decade ago with breaking changes in php 5.3. Old software has to be updated to keep up, else it breaks or gets compromised. Linux OSes from a decade ago can't run any of the software we're running on the server right now, literally. Forum software: our old version of phpBB didn't support php 7. In fact, it forced us to stay on php 5.6 which stopped being actively supported 3 months ago. So we couldn't stay on php 5.6 for much longer, but moving to php 7 required upgrading phpBB versions and losing our old forum style. What would you rather have me do? Forum style: we were using a table-based layout (Subsilver) that was not only bad for screen readers, but some companies have actually been sued for discrimination against blind people (as far back as 2006) for not switching to CSS. The old layout, with all the tiny images and extra code markup, was also painful to load on slow internet connections. Also, half of web traffic in the US is now via mobile devices. Google and other search engines are penalizing websites that aren't mobile friendly, for good reason, as it leads to difficult navigation and a poor experience for the user of a handheld device. Hastening our migration away from the old table-based layout was the fact that phpBB dropped the Subsilver style altogether in 3.2, which we updated to yesterday. Did we have to update yesterday? No, we could have waited until our old 3.1 version was hacked or vulnerable and then scrambled, and we'd be back here having this same conversation either way. Subsilver has been a bane of web designers for a long time, and phpBB has been phasing it out for the last 4-5 years, we've just been resisting. Well, here we are. There are lots of other fixes, updates, and so forth - but nothing as noticeable as a design change. Many of those required or necessitated the design change. Originally, I proposed putting together a bootstrap-based design that matched the homepage, but Bill (rightfully as I can see now) shot it down because he thought it would be too disruptive to the amazing, long term members like yourself, who help make ThinkPads.com such a great resource. For what it's worth, I spent considerable time trying to make the new layout of this forum match as closely as I could with the old layout. It's not easy, considering Prosilver is a completely different template from which we have to base the design. Perhaps someone else could have done better, but this is the best I could do. So many things changed, from images to font-awesome and the way phpBB handles PM notifications and new profile stuff, etc. There was no getting it exactly the same as old and, besides, many of the new features are amazing. For example, have you put your curser over a topic title on the view new posts page? Have you noticed the sharper images at all resolutions, including Charlie and his colorful parrot? Have you noticed the style is responsive (try resizing your screen or browsing from your phone)? TL;DR: So yeah, there's wasted space on large screen resolutions, and some areas look too crowded. Some features I added in, that you weren't used to, are commonplace on today's web. The colors don't contrast as much as the old style. Some of these nuances are flaws, some are improvements, either way things look a little different. Some like it, some hate it. There's no way to win over everyone, but we can work together to try to improve things. If that doesn't work, we'll make several styles available so that you can choose something different, but none will perfectly replicate the old style. I'm looking forward to reading your replies and trying to answer your questions. If that doesn't work, we'll make several styles available so that you can choose something different, but none will perfectly replicate the old style. I'd be very interested in this option. Not to knock down anyone's effort and work, but these new styles should've been offered in the first place. I've gone through upgrades on several different - not necessarily PC-related - forums over the past decade and when one makes significant changes to the look and layout having more than one option available is usually a pretty good way of silencing old grouches like myself. Have a look here and tell me what you like: https://www.phpbb.com/customise/db/styles-2 - having a consensus for (hopefully just) a couple extra styles is ideal. Just be sure it's compatible with phpBB 3.2. I'll speak with RBS and Bill and if it's a go, I'll get it up. There are also styles here: https://themeforest.net/category/forums/phpbb that cost a little bit of money, but are generally nicer. I highly appreciate the "open mind" approach from your end. Unfortunately, I'm highly unlikely to have any spare time to devote to this particular effort - that I want to be concentrated on 1001% while I'm researching the options - before this upcoming weekend. Will most certainly keep you posted. Thanks. 2 secs messing with it in dev tools and It's exactly the way I'd like it. Not sure why opinion against it is so strong. It looked very dated and was poor on mobile. It doesn't look "that" different now tbh. Not sure why opinion against it is so strong. It looked very dated and was poor on mobile. It doesn't look "that" different now tbh. mdvaldosta wrote: We automagically forward requests from the http:// to https:// so that folks won't get lost, and everyone stays secure. I'm guessing your issue is with Tapatalk or some other app, and unfortunately I wasn't aware that there would be issues with that, and even now I don't know what I could do to alleviate that. Tapatalk didn't have a problem, so you shouldn't have to worry about that. 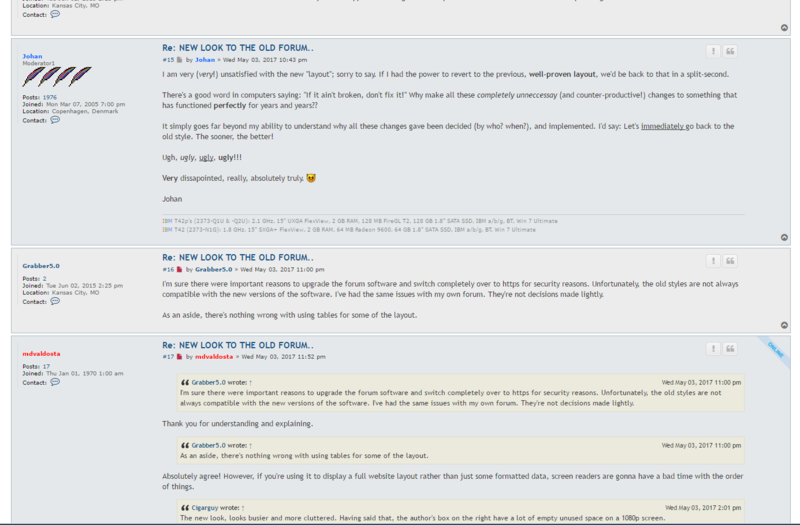 Forums is a Tapatalk-compatible (to the extent it can be.. they are much less developer-friendly than they used to be. That and webOS doesn't support a lot of newer web standards.) app for webOS phones. Nice fresh look, didn't know where to log in. I'll get used to this look. First the TrackPocalypse and now this? I figured security and ease of use would be a good choice for change, thank you! I don't really mind the wasted space at all, I zoomed in 150% on my CB001 Pixel, I'll do the same on my FHD TPs. Additionally with a newer phpBB format, I will be able to utilize the 'styles' from other sites with the Stylish extension on Chrome. I'll find a nice black/gray/big blue look for the forum or figure out to make one. Coffee, ThinkPads & Nikon Fan. i TRIED to retain the old subsilver "look" for as long as was possible..
and i also am not in favor of the current look BUT i WILL get used to it..
just like i must get used to a lot of new things (arthritis in my fingers, aches where there never WERE aches before, etc., etc. ad inf)..
gawd bless joe hayes for doing what he has done, otherwise this forum would have died in the most recent bot attack..
the server gets hack attacks thousands of times A DAY..
so please be nice and bear with us while we all try to keep things going..
it was either grow and change or wither away and die.. you choose, grow or die..? I love the new mobile scaling. It looks great. Haven't seen it on the ThinkPad yet though. Hey Grabber5.0! It's Shuswap from webOS Nation. I really need to consolidate my usernames at some point. Which reminds me, it's probably time to go ahead and change my account password. The new layout is very nice. I'm not sure if the forum is running a newer phpBB version or if it has a different theme installed, but in either event I like it. I first noticed it today while accessing the site via my Android phone. It is much more mobile-friendly. So, Admins, thank you for all you do! Please move the author block back to the left column. It's awkward on the right and largely invisible to me. I have vision issues with my right eye, and I have to make an effort to see it. I do NOT respond to PM or e-mail requests for personal tech support. Omineca wrote: I love the new mobile scaling. It looks great. Haven't seen it on the ThinkPad yet though. Howdy! It was probably through you that I found out about this forum. Unrelated, I bought an x230t on eBay a couple months back, so I've been on here more often since then.